Pencil points to Interlochen, Michigan. The seed for the journey was planted months ago, when Mike Delp and I were conversing about the chapbook’s final stages. “Long-shot thought,” I wrote to him. “It would be pretty special to have some kind of book launch event. Or at least to try. 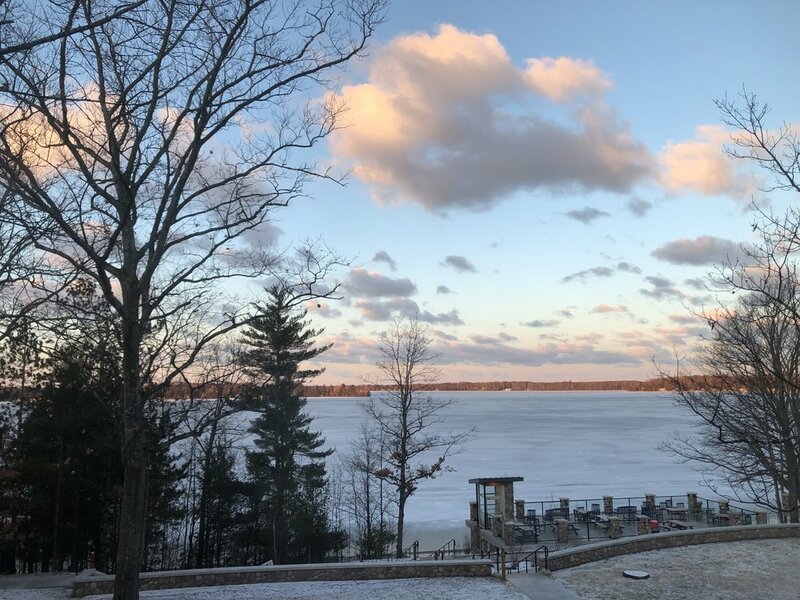 What do you think the chances are that Interlochen Arts Academy or some other place you think is good would allow us to hold such an event?” From that wondering-out-loud, a whole wonderful week’s worth of traveling, connecting, and sharing evolved. I left my Blue Ridge Virginia home on Sunday, March 31st, with a car-full of books, winter clothes, a tiny 1930s-era printing press, and an emergency tin chocked with my spouse’s homemade chocolate-chip cookies. I drove north-west through hours of snow showers. 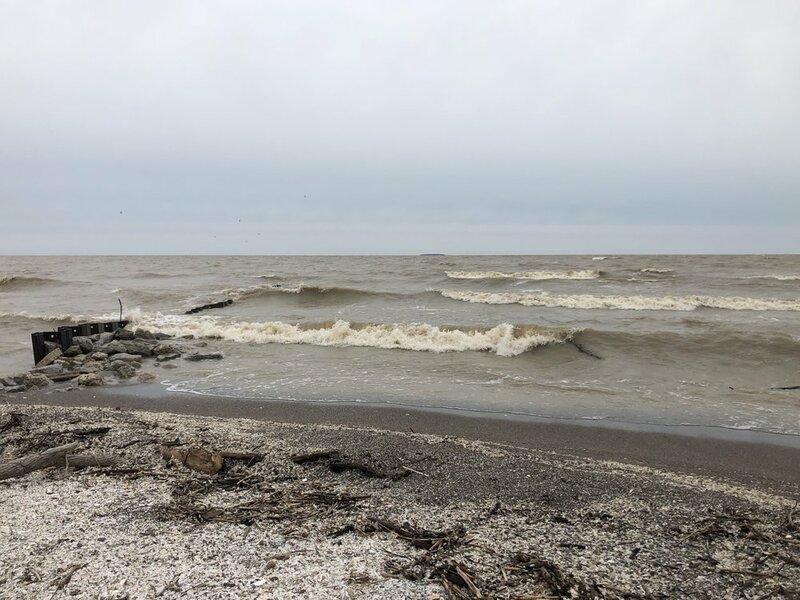 Eager to take a break from the highway, I got off the interstate in Ohio after seeing a sign for a natural area along the shores of Lake Erie east of Toledo. 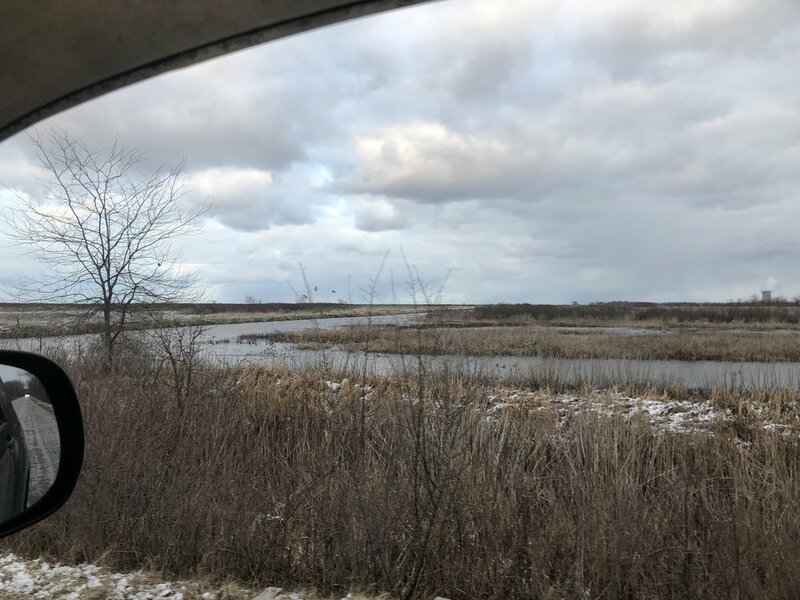 Around sunset, I pulled into Magee Marsh Wildlife Area (contiguous with Ottawa National Wildlife Refuge), and slowly drove the 1.5 mile park road. The wetlands were teeming with birds. Red-winged blackbirds were chatting in the brush along the edges of the road, and I rolled the windows down to take in their husky whistles (the air temperature was around freezing, but I didn’t care—this was the soundtrack to Spring!). As I rounded a woodlot into an expanse of wetland, two Sandhill Cranes banked over my car and settled down somewhere out in the marsh. Hundreds of waterfowl paddled, dabbled, and preened along the waterways—Pied-billed Grebes, Buffleheads, Ring-necked Ducks, gorgeous Northern Shovelers, and so many more. I stopped to listen and watch. Looking down at the darkening water at the road’s edge, I saw bubbles break the surface, a stream of them popping up for a dozen yards. Soon, the large chocolate-brown head of an adult beaver emerged. It swam past me, not twenty feet away, intent on its evening rounds. After the quick shadow of a Harrier strafed my car, I looked up—away to the west two Bald Eagles were flying toward their enormous nest, high in a tree along the lake shore. Stunned to grateful silence by it all, I resumed the highway just as last light was flaring neon yellow and pink through a distant snow squall. 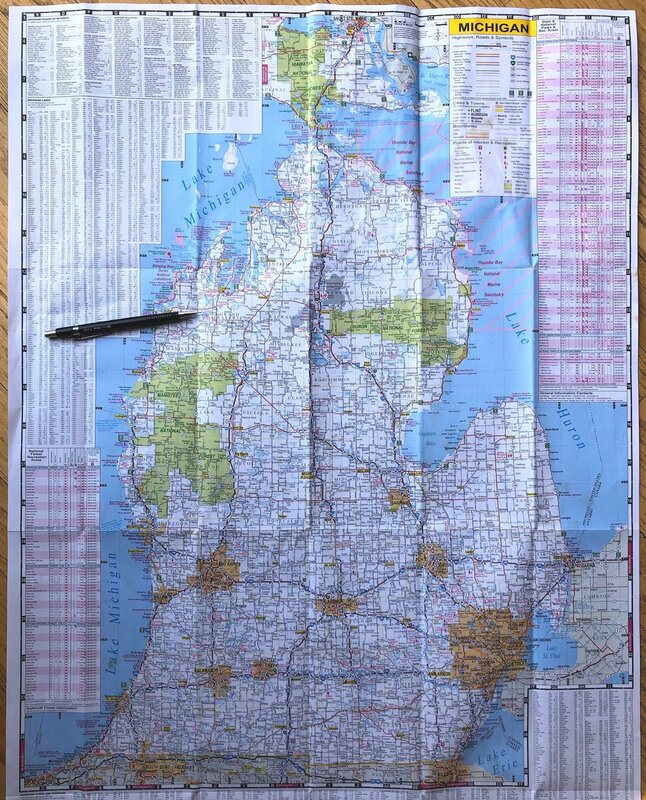 The next day, already low on cookies, I drove in blessedly bright sunshine across Michigan to Hudsonville, just to the west of Grand Rapids and not far from the shores of Lake Michigan. There, I finally met-in-person the poet whose chapbook I had the honor of publishing in 2018— J. L. Davis. We had first connected through, of all things, Twitter. A couple of years ago, my admiration for her crystalline short-form poetry led to a conversation about the possibility of creating letterpress edition of some of her work. Wildflowers Ending debuted last November (and there are only 12 copies left; if you’re interested, see the webpage here— stbrigidpress.net/books/wildflowers-ending ). The poet Jessica Davis (L) and me. 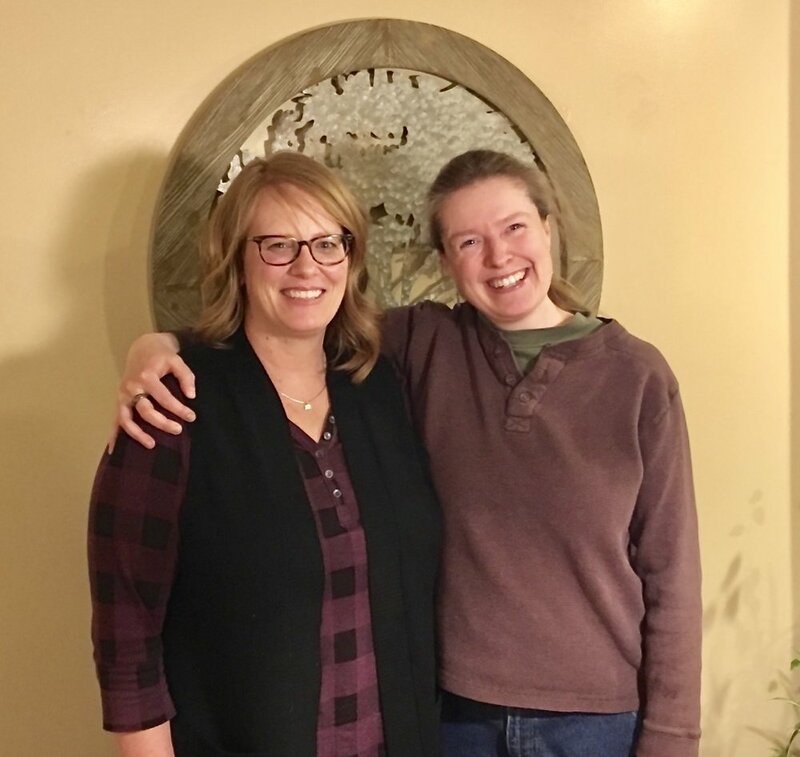 Jessica and her family generously put me up for the night last Monday, and we spent hours talking all things poetry-and-more over cups of ginger tea and, later, glasses of red wine. Like the beautiful oaks in her backyard, Jessica is an old soul; we traversed time and space, experience and emotion and creative expression, in our rich, wandering conversations. She’s as tuned to language and the heart as white pines are to wind and birdsong. Tuesday morning, I left their home filled with deep friendship, gratitude, and a baggie of delicious chocolate-chip muffins. The road north lead into more snow. 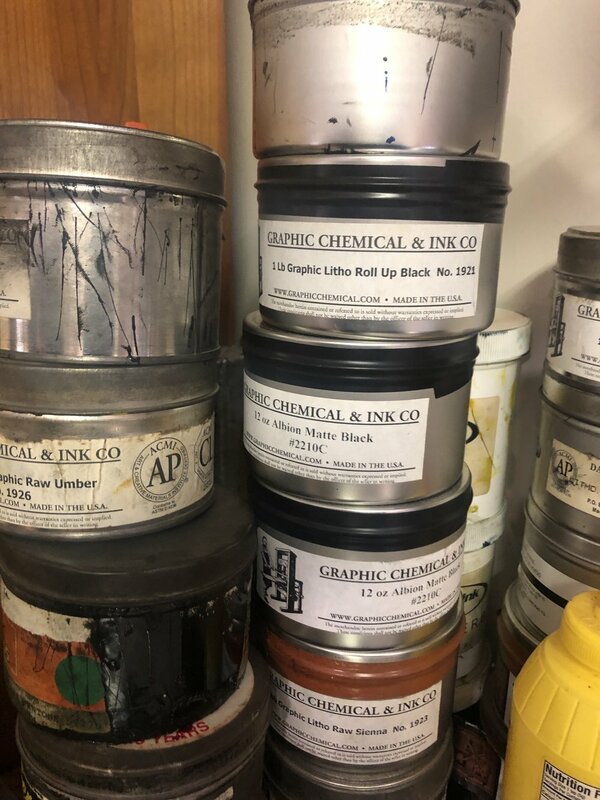 Due in Interlochen by late afternoon, I wanted to make a pilgrimage first to one of my early mentors in traditional fine press printing—Chad Pastotnik of Deep Wood Press. The ground began to whiten the further I went, until snow-plow piles of the dirty white stuff were banked higher than my head. 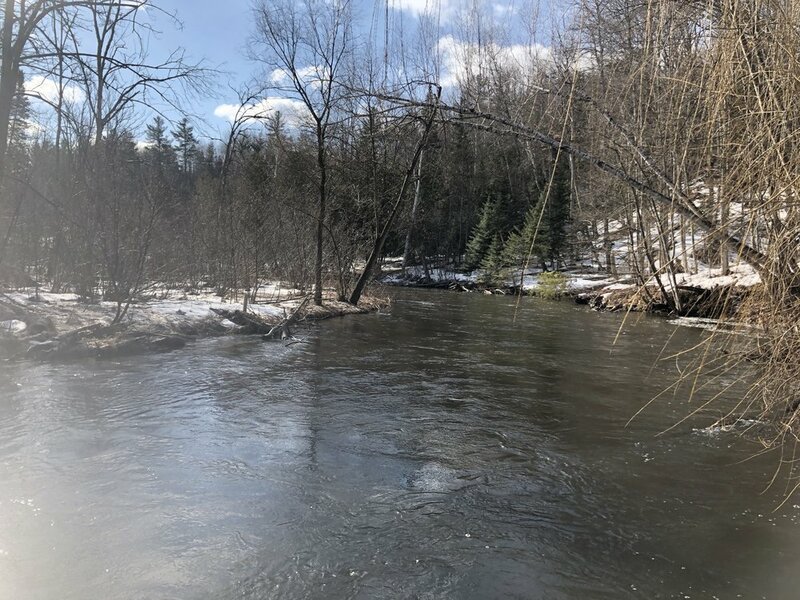 I wound west and north of the small town of Mancelona until I found Chad’s place, tucked back in a grove of conifers along the swift Cedar River. Walking up to his shop across shoveled but icy walks, I inhaled the heady scent of the trees, the cold. A merganser floated past; a few chickadees announced me to the woods. Opening the studio door at my knock, Chad ushered me into his world—ink and iron, lush papers and sharp tools, eagle eyes and exactitude. One of the most accomplished fine press printers on the planet, he has operated Deep Wood Press since 1991. I came across images of Chad’s work early on in my learning about traditional printing and bookmaking, and it was truly an honor to experience DWP first-hand. He has an excellent collection of hand-set type and Linotype matrices for book work, and prints mostly on a venerable old Vandercook 219. In the time he generously shared with me, we talked over equipment, inks, his stunning library of fine press books, the business of book arts, and some of the finer points of colophon construction. I left filled with new knowledge, inspiration, and more gratitude. Winding my way southwest in the late afternoon cold drizzle, I glimpsed frozen Lake Michigan from Traverse City before dropping down to the world-renowned Interlochen Center for the Arts. I checked into the Stone Hotel on campus, where my second-story window looked out on frozen Green Lake. The sky and the ice were nearly the same pearl-grey color, with a green-black scar of coastline between. A few crows careened from the top of a pine and out across the expanse. At 6pm that evening, I went downstairs to the hotel lobby, where Michael Delp was waiting for me. The connection and rapport I’d felt with him through social media and email was immediately incarnated with a hearty hug and a deep dive into conversation. He took us a few miles down the road to Bud’s Coffee Shop, a local hangout. 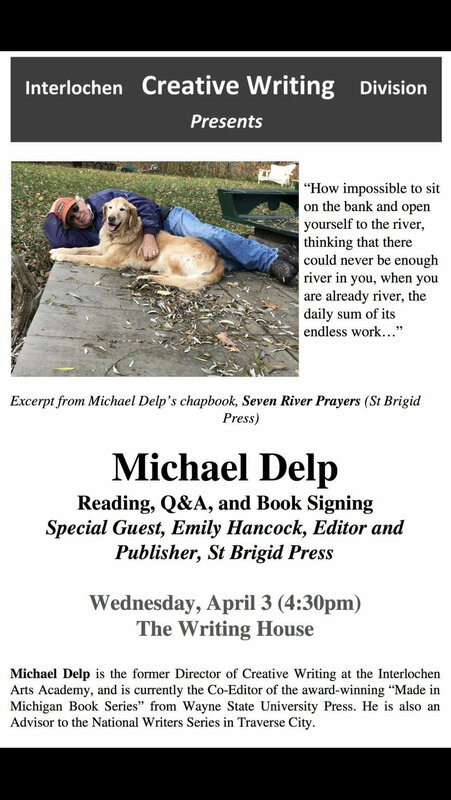 Over burgers and coffee, we rambled all over the woods—poetry and the poets we’ve known, families and dogs, his 30 years of teaching and administrating at Interlochen, his passion for words and rivers. As with Jessica Davis, after so long in electronic communication it was fantastic to actually sit across a table from each other and talk. It felt like we’d just got started when it was time to head back to campus and try to get my brain unwound enough for sleep. The next morning dawned bright and cold. Mike drove us a short ways east of campus to the spectacular little retreat he and his wife have on the banks of the Boardman River. We crunched down the slick slope of old snow to the fast-moving water—sunlight and eddies whorled across the surface. “It’s pretty high right now,” Mike said of the water level. 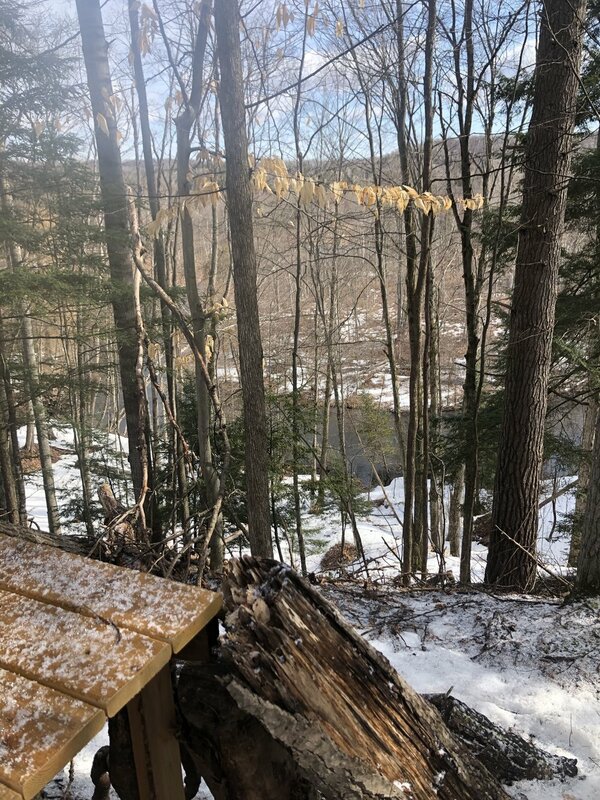 “Usually I can walk across here to the other bank.” The small old cottage, renovated and enlarged over the years, held comfy furniture, fly rods, a wood stove, and a view of heaven. 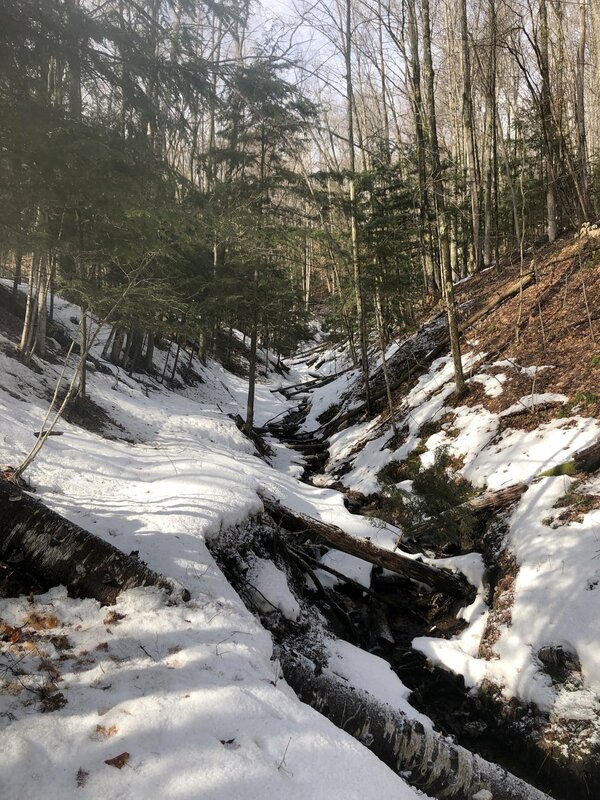 Before we left, I followed Mike up the steep grade through open stands of hemlock, poplar, and ash (the latter mostly decimated by the green ash borer beetle), stepping in his boot-prints for purchase in the crusted snow layer. Just a handful of miles as the crow flies from Interlochen, this place was a world away. And the beating heart of Mike and his family. We headed back to campus in time for lunch with the Creative Writing Department Faculty. Mika Perrine, a friend and former student of Mike’s, is the Interim Director of the department, and the one who made it possible for me to come visit. She and Joe Sacksteder (the incoming Director, as of June 1st) and Bri Cavallaro and her husband Chase all welcomed me generously amid a cafeteria bustling with high-school boarding students carrying instrument cases and be-stickered laptops. The energy, intensity, and vigor of students and teachers alike was palpable. After an hour, this middle-aged introvert was excited and exhausted at the same time! Photo courtesy of The Writing House Instagram account. The master class on book arts that the department had invited me to do started at 3:30pm. By 3, the splendid Great Room of The Writing House was filling with students. After a bit of fiddling with the projector, Mika and Joe got my computer slideshow running, and I launched into a brief presentation on the history, immediacy, and vitality of traditional printing and publishing: “The Body of the Book: Toward an Embodied Ecology of Literature.” The students and faculty listened as I prattled on for a bit, until the talk drew to a close and it was time to get busy and actually make something. I passed around baggies of paper, punching awl, needle, and thread. In a short while, these dedicated, accomplished authors (students and teachers alike) had made a couple of blank books to hold their new ideas and creations. 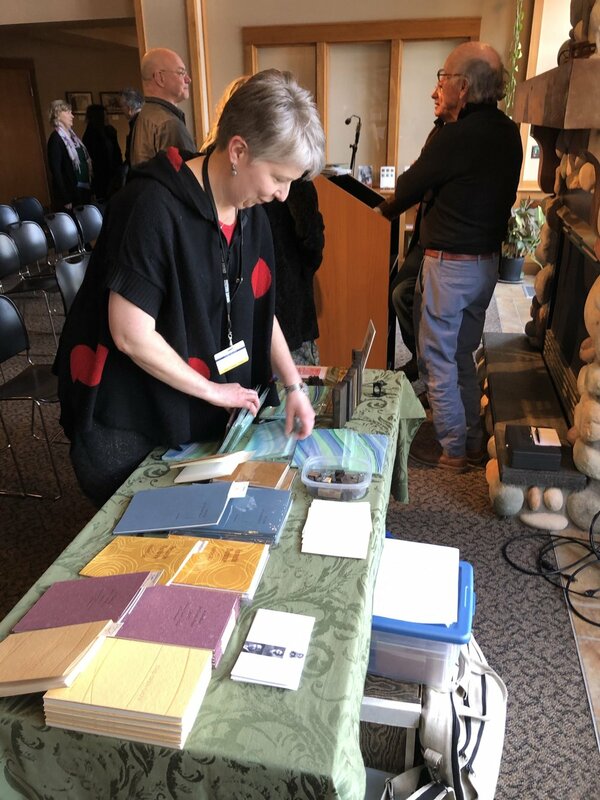 As they finished, I invited each one up to the table where I’d set up the only printing press I can lift—a sweet old 1930s-era hobby press—and everyone pulled a keepsake print. Huzzah! What a delight to meet and work with these young folks and their teachers. 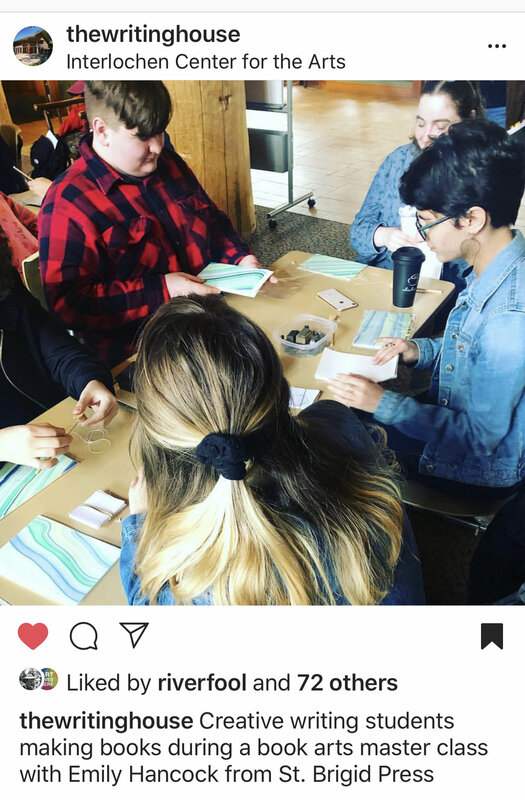 What an honor to spread the gospel of handmade books and letterpress printing to the likes of these brilliant human beings! 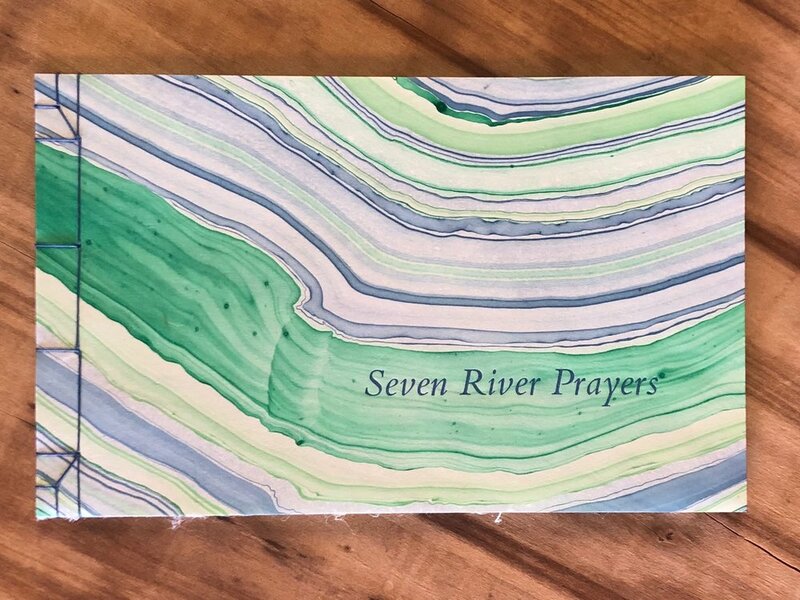 Directly on the heels of the class was the official launch of Michael Delp’s Seven River Prayers. The students moved en masse from the tables where we made the booklets to front row seats near the lectern. Faculty, friends and family of Mike’s, and community members filled the other seats. Mika called us all to attention and shared Mike’s bio, then turned the proceedings over to him. An old hand with a gathering of literature-lovers, Mike held us rapt with his particular rhythm of reading—sharing a poem; sharing part of his process as a writer; a quote by Jim Harrison; sharing another poem; a quote by Thoreau; sharing about the making of the book; one more poem. Five minutes in, we were all converts to this force-of-nature poetic experience. Including, apparently, Mike’s own grandson—four month old Wilder, bouncing in his parents’ arms at the back of the room, gurgled and burbled at his Grandad reading poetry. The expression of love and joy on Mike’s face was transcendent. After the reading, folks hung out for a bit and talked, got their copies of the chapbook signed, and came up to the St Brigid Press table to peruse the show-and-tell display of type and tools. I had left one of Mike’s poems composed in metal type, so that folks could see some of the process of traditional printing, and also took along 125-year-old wood type letters to heft in hand. There’s nothing like picking up and holding language in its three-dimensional forms. Mike and his wonderful wife Claudia, Joe Sacksteder, and a couple of their dear friends and I went out for a delicious supper that evening. (My first taste of Lake Superior whitefish was terrific.) More engaging and inspiring conversation flowed, first over food and later over a celebratory glass of wine at Mike’s and Claudia’s sweet, dog- and book-filled home on the shore of Green Lake. When Mike dropped me back off at the hotel, I stood outside my car for a while, cleaning ink off the press under cold starry skies. As with each experience on this trip, when night fell and I crawled back into the hotel bed, I felt at the same time exhausted, elated, and full of profound gratitude. The 1930s-era traveling printing press. Next morning, there was only one thing left to do—head home. And I was ready! By 7:52am I pulled out of the campus parking lot and headed southeast, into a bitter cold but blessedly bright day. Around mid afternoon I reached the outskirts of Toledo, and decided to stop back by the wildlife refuge. Tree swallows were swooping and swirling over a pond near the entrance to the visitors center, and a Great Blue Heron and several Egrets stalked the edges. I drove the marsh road again, past clusters of waterfowl, to where it ended by the shoreline of Lake Erie. 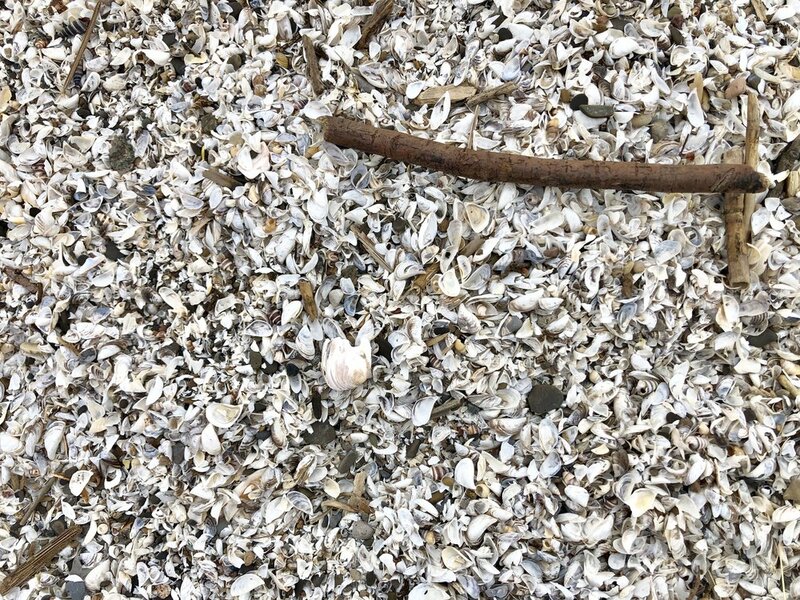 The fierce wind nearly blew me over as I approached the pounding, latte-colored lake edge on foot, crunching over low berms of empty shells . Seagulls winged by, west to east, unfazed by the gale. Turning back from the razor wind to the thin line of woods separating shore from marsh, I spied two Bald Eagle nests high in still-bare trees. Both were occupied, and I regarded with awe those parents hunkered against snow and cold, sheltering new life. As I left the wildlife area and worked my way towards the interstate past fields of stubble, I must have seen a dozen more eagles. The day, and my energies, diminished as I left Ohio and pressed east into the ridges and valleys of western Pennsylvania, and I stopped for the night on the outskirts of Pittsburgh. The next morning broke with a cold rain, and I finished the long road-trip in soggy fog. It was all worth it, though, when I finally rolled up our driveway and was welcomed home into my spouse’s open arms and the pup’s ecstatic leaps. What an amazing, 1757-mile journey—new places, new people, new experiences, and enduring friendships, memories, and deep gratitude. We are pleased to announce the publication of Soundings, a new book of haiku by Emily Hancock. Inspired by the beauty of the Blue Ridge Mountains, where Hancock makes her home, this lovely book collects over 30 of her poems and 3 original linoleum block prints. Designed, hand-set, letterpress printed, and hand-sewn here at the Press in a limited edition of 85 books. Pre-order a copy HERE; books will be shipped on November 10th. If you are in the area, please join us for the official Book Launch Reception and Signing ~ this Friday, November 7th, at 5:30pm at Stone Soup Books (908 W. Main St., Waynesboro, Virginia). With thanks, and all best! We are pleased to announce a new book forthcoming from St Brigid Press in November: Soundings, a collection of haiku by Emily Hancock, illustrated with three prints by the author. Hancock has been published in various literary journals, including the Appalachian Journal and the Greensboro Review. This limited edition book will collect over thirty of her haiku, each a small meditation on being in nature and the nature of being, as well as three prints from her original block carvings. All of the type is set by hand (in the historic Koch-Antiqua typeface), letterpress printed on beautiful Rives mould-made paper, and sewn with linen thread. SAVE THE DATE!!! The official Book Launch for Soundings will take place on Friday, November 7th, at 5:30pm at Stone Soup Books and Cafe (Waynesboro, Virginia). Hancock will give a short reading and sign copies of the book, which may be purchased at that time from Stone Soup. Light refreshments will be provided, with dinner available from the cafe. Hope to see you there! If you are out-of-the-area, you can pre-order the book now ~ click HERE (direct link to our secure online store). Books will be mailed out on November 10th. Greetings, All, and Happy Autumn :-) We are honored and excited to let you know about this event St Brigid Press is participating in at The Barn Swallow Artisan Gallery, taking place this coming Sunday, October 5th! Full details below, courtesy of Barn Swallow artists/owners Janice Arone and Mary Ann Burk. Save the date, and we'll see you there! Celebrate fall with a new art exhibit at the Barn Swallow! Three printmakers showcase their nature-influenced work at the Barn Swallow this upcoming month. Lotta Helleberg will display naturally dyed and eco-printed textiles, artist books, and journals. Emily Hancock will bring hand-typeset and letterpress printed poems and other texts, as well as hand-bound journals. Lana Lambert will exhibit intricate Japanese woodblock prints. Please join us for an opening reception on Sunday, October 5, 2014, from 1 – 3 pm. 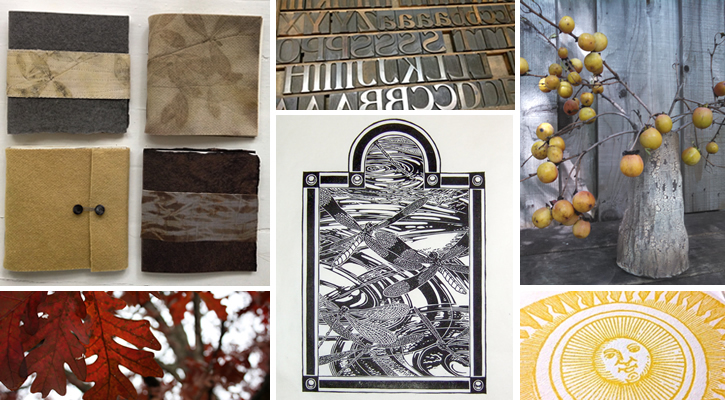 The artists will offer demonstrations of traditional typesetting, Moku Hanga block printing, and simple book binding techniques. We are also happy to announce that starting on October 14, we will extend our opening hours to Tuesday – Saturday, 10 am – 5 pm, and Sunday 12 – 5 pm. THE BARN SWALLOW, Artisan Gallery 796 Gillums Ridge Road, Charlottesville, Virginia 22903 Hours: Thursday – Saturday, 10 am – 5 pm, Sunday 12 – 5 pm 434-979-4884, barnswallow@comcast.net www.thebarnswallow.com Copyright © 2014 The Barn Swallow. All rights reserved. * We are in the early stages of the next broadside in our "Poetry in Translation" Series. (Learn more about this Series HERE.) Poet Jeff Schwaner will again be lending his translation skills to this project, rendering into English an 8th-century Chinese poem that will be a companion piece to "Sky Dream," the first production in the Series. * Photographer James R. Plitt and the Press are teaming up to produce a limited-edition book that shares, in word and image, the beauty of Appalachian mountain creeks. Plitt's stunning color photography of the region will be paired with a moving original poem by Emily Hancock, letterpress printed and hand bound. * Resident printer-poet Emily Hancock has three poems featured in the current issue of Appalachian Journal (Vol. 41, Nos. 1 & 2), published at Appalachian State University in Boone, NC. For more information about that, click HERE. She is also at work finishing a small manuscript of haiku, which will be forthcoming from St Brigid Press in Fall 2014. * If you missed the official air-time on June 6th, tune in to NPR-affiliate WMRA's interview with Emily Hancock HERE. 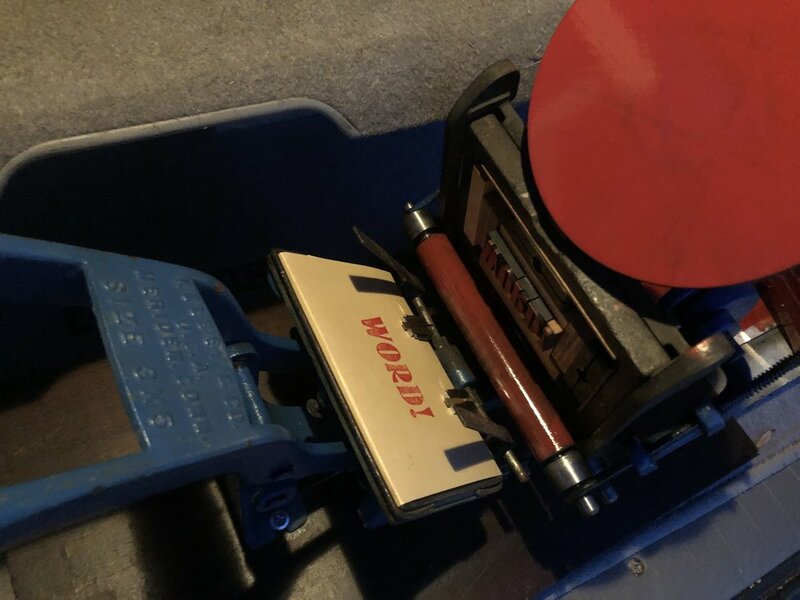 It's a 9-minute piece produced by long-time NPR reporter and host Martha Woodroof, who speaks with Emily about St Brigid Press, bookbinding, letterpress printing, and poetry. * Last but definitely not least, we are in the design and production phases of a host of new stationery items: cards, bookmarks, coasters, gift tags, postcards, and journals. *WHEW! * That's all for now ~ we'd better get back to work! We'll let you know as the above projects become available. Until next time, all the best from the Press.